In a world where the have-nots are more widespread than the haves, the Social Development sector adresses the largest segment of the world's population. Still the sector is considered as an industry that survives on the favors of the haves. This limits the sector by all means to innovate widely, and develop approaches, that can bring the haves and have-nots closer, to form a more equitable society. While all sectors and industries have Innovation laboratories to churn out new technologies, products and services, the Social Sector is deprived of such a laboratory. Reason: All doles and favors prefer to support only age-old practices (so called 'Proven'), as returns on these investments are not always tangible or profit making, and therefore risking such investments on innovations, are discouraged. Result: As the world of haves grows leaps and bounds, the world of have-nots remains comparatively deprived always, with its numbers swelling, as world economy slowly but steadily concentrates towards the haves. Identifying the need of a laboratory, as a virgin land that required exploration, a group of professionals with many years of corporate experience, but with socially inclined hearts, decided to dedicate the rest of their lives in this quest. Thus OASiS - A Social Innovations Laboratory was born. 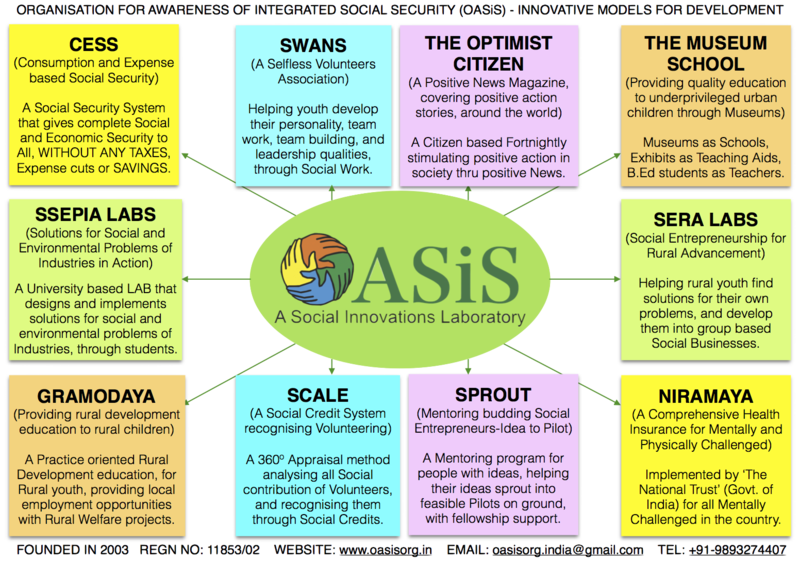 With a mission to continuously innovate for the sector, and devise models and approaches that can help social sector organizations and deprived sections of society, solve their long standing problems, OASiS set out on a path untraced and unpaved. OASiS identifies gaps/problems in the social sector; researches reasons behind their long existence; develops innovative, simple, practical and easily replicable solutions to address them; pilots the solutions itself; develop them into models; and then gives them out to the social sector for replication. One has been nationally implemented by the Government of India. One is being replicated by the Government of a State of India. Four are being replicated Pan-India by various NGOs and Citizen Groups. One is being replicated by Foreign and Indian Universities. Two are at the Pilot stage. One is on the Drawing Board. With a mission to continuously innovate for the sector, and devise models and approaches that can help social sector organizations and deprived sections of society, solve their long standing problems, OASiS has set out on a path untraced and unpaved. With enough experience and fresh ideas in its bags, OASiS is also helping budding and aspiring Social Entrepreneurs. People willing to dedicate the rest of their lives towards social good, use OASiS as their stepping stone. They either replicate the models developed by OASiS in their own regions, or bring their fresh ideas to the table. OASiS helps the Social Entrepreneurs take their ideas from the ideation stage to the pilot stage. Once their pilot becomes operationally and financially self-sustainable, OASiS helps the Entrepreneurs develop them as model for replication, and take them forward. Many Social Entrepreneurs have used the Social Innovation Lab, and have made big strides in the sector with their models. Almost all models that have come out of the Lab, have won Innovation Awards at national and international levels. OASiS has now opened its doors to Universities and Institutes, who would like their students with brilliant ideas, to walk the roads of social entrepreneurship. These students can use OASiS’s mentoring program to take their ideas to the pilot stage and beyond. Students not exposed to this earlier, can take OASiS’s ‘Certificate course on Social Innovation and Entrepreneurship’, and develop new ideas for Development. They can then take their ideas further, through the mentoring program as well. Anyone from the Corporate wishing to make a move to the social sector, Students from any institute and stream wishing to do something great and long enough for society, are welcome to OASiS. Social sector organizations that have identified long standing problems and want solutions, are also welcome to send their problems to OASiS.